Compiled from some of your favorite designers like Anna Graham, Amanda Jean Nyberg, Jeni Baker and more, this unique collection of projects are internet super-stars! Why scroll through endless tutorials online looking for those instructions on how to make a zippy pouch, when you need to make that last-minute gift right now?! 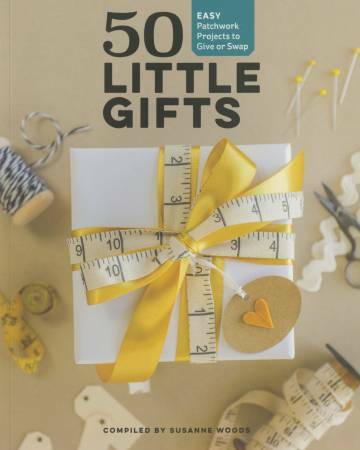 50 Little Gifts is a collection of all of those projects you make the most from the designers you know and love: napkins, pincushions, gift card holder, pieced keychain, electronic cases, bibs & fabric baskets...AND inspiration for some unique gifts like a Christmas pickle ornament, geode coasters or a teabag wallet! Unlike some hastily posted tutorials online, all of these patterns are fully tech edited to ensure success! We guarantee this will be one of the most-used books on your shelf!